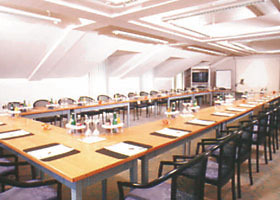 The Golden Tulip Olymp is a top-level hotel situated in the northern part of Munich. because of the elegant decor that features fine woods, including old pine, cherry and walnut, handmade sculptures,sophisticated materials and beautiful paintings, the Olymp Hotel is full of an inimitable Italian style and atmosphere. The Olymp Hotel also offers an array of facilities and services that are sure to fulfill the requirements of both business guests and tourists. 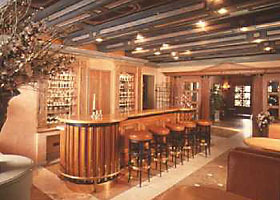 The hotel offers 96 top-level guestrooms, apartments and suites. Every guestroom offers a private bathroom with shower or bathtub, hairdryer, cable television, direct-dialling phone, and minibar. 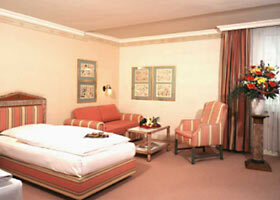 Deluxe guestrooms and suites additionally offer air-conditioning and trouser press. Several guestrooms are equipped with an ottoman. 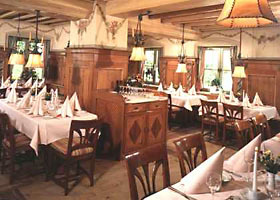 Three restaurants serving superb Italian and regional Bavarian dishes. Non smoking area in common with the decrees of Health Secretary of Germany, of January 1, 2008. The below-mentioned rates are already discounted, 56 - 59% in comparison to the rack rates. Cancellations can be made 48 hours (6 pm, GMT +01.00 hrs) or earlier prior to the guest's arrival to the hotel without any charges. Fairs, Congresses and Oktoberfest: Cancellation or changing after any booking are impossible. Credit card is mandatory to book. Cards will be debited at 100 %. No refund. 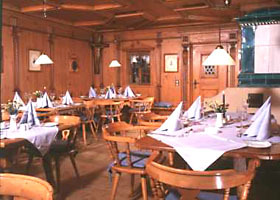 The Golden Tulip Hotel Olymp is situated in a pleasant area between Munich's Franz Josef Strauss International Airport and the center of the city. 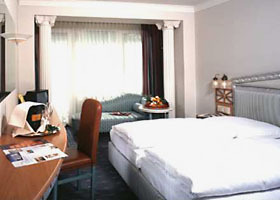 For both business and leisure travellers the Golden Tulip Hotel Olymp has the perfect and unique location. The Golden Tulip Hotel Olymp is easily accessible by all major highways such as the A 9 (Exit No 69, "Eching-Neufahrn") Munich-Nuremberg-Berlin (one minute ride). At the first traffic light turn left, and at the next light turn right. You will find the Golden Tulip Hotel Olymp on your left-hand side. Fairground Messe ICC and ICM 23 km.